Usually, I think of the weakest piece of wordplay I can possibly muster to title these blog posts (“to their detriment” some people may say), but on this occasion, I felt I needed to shoot straight to the heart of the matter. Sentric Music has been doing what we do for over a decade now, helping out tens of thousands of songwriters worldwide ranging from those writing their first ever song to those who have sold millions and everywhere in-between. We administer well over half a million copyrights and counting which we’re able to do thanks to the super duper swish McFlashy software and infrastructure that we’ve developed ourselves. So that’s nice. Nope. We’re not like the PRS. I can tell you right here and now that although we do indeed like the PRS, we absolutely adore them in fact, we’re definitely not like them. The PRS (Performing Rights Society) is a PRO (Performing Rights Organisation) and Sentric Music is a publisher. Each major territory has its own PRO. The UK has the PRS, Germany has GEMA, Norway has TONO, Sweden has STIM, America has ASCAP, BMI & SESAC etc. There’s bloody loads of them. In fact, you can see most of them over on our Big List Of Music Industry Acronyms if you fancied looking at that. 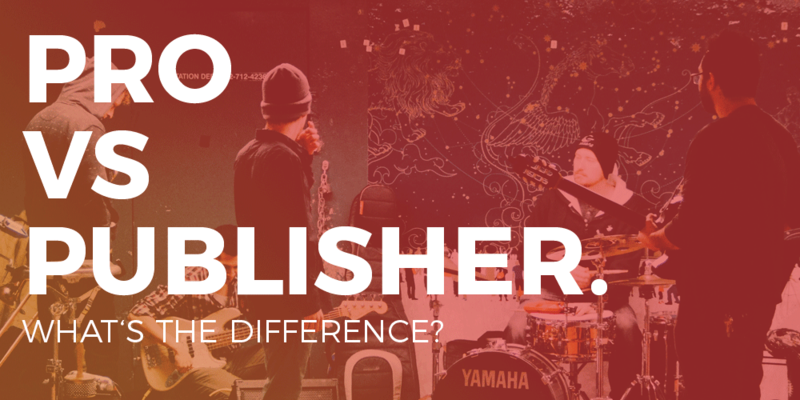 We, at Sentric Music, are publisher members of lots and lots of these different PROs around the world. If you use Sentric (which I hope you do or will be doing after reading this) then we take the relevant information needed about your songs and then register those copyrights with all these different PROs around the world to make sure that any money they collect for you in their territory gets back to your pockets as soon as possible. So for example let’s say you play a European tour which lasts for twenty dates across seven countries; if you didn’t have a publisher (or use Sentric’s service) then you’d have to wait for seven different PROs to collect your performance royalties, find out who you are and with what PRO you yourself are registered with as a composer and then pass that to them to give to you (whilst both taking a cut). This creates a massive lag in getting your income, whereas if you work with a publisher (like Sentric, naturally) we will have registered your copyrights directly with the seven PROs in question already so, therefore, you’ll receive royalties from us at the next available distribution. You’ll get more money and you’ll get it faster. Lovely. And it’s not just performance royalties collected by the PRS, we also administer mechanical royalties which are collected in the UK by the MCPS (Mechanical Copyright Protection Society). Which basically means the publishing income generated from streaming services like Spotify and Apple et al from a significant amount of countries comes to us in a single payment once a quarter. Nice and clean! This has resulted in a 479% increase in digital royalties to our artists since 2013, a trend we’re only expecting to continue thanks to the rise of streaming. Finally, the wonderful world of sync which is another part of Sentric’s service we’re very proud of. Our in-house sync department (http://sentric.ms) are getting our artists’ music used on TV/adverts/movies/games/promos on a daily basis worldwide and have been nominated as the ‘Best Indie Publisher’ at the Music Week Sync Awards for four years in a row now, so they must be doing something right, eh? For more info on sync, be sure to check out this dedicated blog post. Very simply put – all we do here at Sentric is add value to your copyrights. And, if you don’t like what we do, or don’t think that we’re adding value, then you can quite simply stop using our service and retain your copyright thanks to how wonderfully artist friendly we are. So it’s a win/win whichever way you approach it. If you’re an emerging artist and you allow us to look after your copyrights then you’re plugging into the same technology, expertise and network as songwriters who have cuts on songs by artists such as Michael Jackson, Drake, Kanye West, Jay Z, Amy Winehouse and many, many more. If those guys trust us to do a job for them, then it’s pretty smart that the same infrastructure is available for absolutely anyone who writes original material, yes? I like that man. That man talks sense. I didn’t even have to bribe him. Music publishing is three things. 1) Boring 2) Complicated 3) Important. Sentric was set up so just as long as you understand point 3 then you can leave it up to us to tackle points 1 & 2 on your behalf. I hope that helps if you’re still a bit unclear then don’t hesitate to call the office on 0207 099 5991 or drop us an email at info@sentricmusic.com and we’ll answer questions you might have.